To get started, preheat oven to 375º. Put 1 Tablespoon of butter in each half and cover top with tin foil. 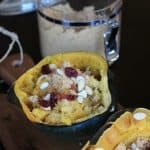 Place acorn squash on a baking sheet, cut side up. Bake in oven for 1 hour and 15 minutes or until flesh is tender and you can pierce with a fork easily. In the meantime, toast sliced almonds in a small saute pan over medium high heat for 5 minutes, or until just browned. Set aside. Lastly, top each half with 1 Tablespoon of brown sugar, 1/4 teaspoon of ground cinnamon, 1/8 teaspoon of ground nutmeg, 1 Tablespoon of craisins, and 1 Tablespoon of toasted almonds.